Currently Roy is at work on two projects, a novel and a true-crime book. The Secret History of John A. is a fictionalized account of the emotional life of Canada’s first prime minister, a prequel to the highly praised 2007 novel Macdonald. Roy is also co-authoring a dramatic true-crime story about the mysterious death of a beautiful young mother married to a scion of the Canadian establishment. “In Conversation with Robert Bothwell,” Furby House Books, 65 Walton Street, Port Hope, ON. Roy will interview the distinguished historian – and his old school friend – Robert Bothwell of the University of Toronto about Bothwell’s latest book, co-authored with J.L. Granatstein: Trudeau’s World: Insiders Reflect on Foreign Policy, Trade, and Defence, 1968-84. Saturday, September 15, 2:00 – 3:30 p.m.
“Doors Open,” Smiths Falls Public Library, 81 Beckwith St. North, Smiths Falls, ON. Roy will be chatting with visitors and signing books for sale at this free event hosted by Friends of the Smiths Falls Public Library. Look for him in one of the tents on the lawn outside the library. 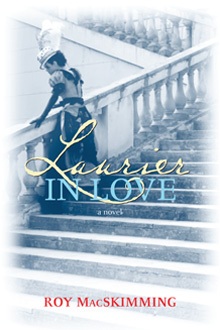 Wednesday, September 26, 2018, 3:00 p.m.
“Laurier in Love,” Delmanor Prince Edward, 4180 Dundas Street West, Toronto, ON. Roy will talk about and read from his novel based on the tangled love life of Canada’s first francophone Prime Minister, Sir Wilfrid Laurier. “The House that Dennis Built,” Quill & Quire, April 2017. Roy’s portrait of the renowned poet and editor Dennis Lee is the cover story in the April issue of Canada’s book-trade magazine. “Laurier’s Sunny Ways,” Canada’s History magazine, Oct.-Nov. 2016. As author of Laurier in Love, Roy is one of three contributors to this illustrated feature article on Sir Wilfrid Laurier’s life and legacy, celebrating the 175th anniversary of his birth (in print or at www.canadashistory.ca). “Wilfrid Laurier: It’s Complicated.” Roy is interviewed by Library and Archives Canada for a podcast about Laurier’s romantic life – his marriage to Zoé Lafontaine and his love affair with his law partner’s wife Émilie Lavergne. Readers can listen to Podcast 032 on the Library and Archives website, www.bac-lac.gc.ca/eng/news/podcasts/Pages/podcasts.aspx, or go there to read the interview transcript. With links to photos and other Laurier material. 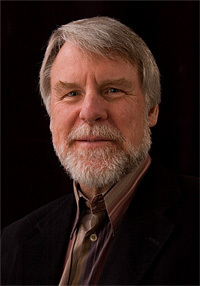 Roy is the author of four novels and three works of non-fiction. 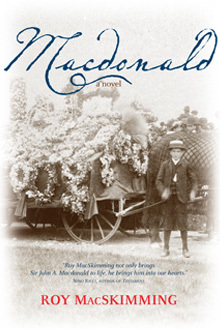 Click on the covers for information and background material about Roy’s latest novel, Laurier in Love, and its companion, Macdonald, now reissued in paperback. Click on the links at the top of this page for Roy’s other books, a biography, and contact information.